Power is not manmade. Power exists in Nature in all manner of manifestations: from the predator’s power, to the power of the hive and the swarm; and so-called “acts of god,” like earthquakes, floods, and storms. Energy is accumulated and unleashed powerfully because of aggressive hunger, self-defense, geological pressure, and seasonal, severe weather patterns. Civilization did not invent power. It was part of the powerful human animal long before civilization constructed itself through widespread repression of instinct, need, and dream. However, that collective psychic repression is what bestowed civilization with its power harvest. Power may be acquired through political, economic, religious, and technological means; and through gender construction: patriarchy and matriarchy as forms of infantilizing oppression. But there is an evolved form of power that interests me as a conscious cultural producer in society: the combined power of truthful information, experience, and knowledge. The ethical power of wisdom, claimed. People are fond of saying that money is the root of all evil. But that is not accurate. Egotism is the root of all evil, whether rich or penniless. Cruelty knows no economic status. So, what does it mean to be wise in the world? What is the ethical authority, the ethical power that maturely emanates from wisdom? Is there a difference between possessing artistic ego as opposed to artistic character? I understand character as diametrically opposed to ego. Ego is a socially based construct imperiously seeking to fulfill personal needs and wants, raw instinct and selfish fantasy. Character, on the other hand, is an ethically formed psychic entity that seeks to trigger and sustain consciousness in the world. Character is powerful by its very nature, because it requires a collection of insights, if not basic enlightenment. Abraham, Buddha, Jesus, Mohamed, and Zoroaster were powerful. Anthony, Pankhurst, Gandhi, and King were powerful. They were perfect imperfects, imperfectly perfect. They embodied moral power, carried within cracked and even broken clay vessels. Theirs was an ethically gained moral power meant for collective good. Socially engaged artists receive a lot of power during their projects. An institution, a curator, and a community give them power to gesture on their behalf. We need to learn how not to abuse this gift; we need to learn how to manifest it for them, positively and fruitfully. We must exercise a nearly ruthless self-criticality. If I am an ethical being, if I can get to know and trust who and what I have become through study, meditation, and experience, then I am not afraid of being episodically invested with power. I am free and confident to harvest it, to share it, and to perform it publicly. I often write and rewrite the history of my projects. Sometimes it is a history of meditative walking; sometimes it is a history of empathic listening; and sometimes it is a history of the right exercise of power. Socially engaged art has its roots in site-specific installation art and sited performativity. Socially engaged art is currently an exciting cultural chapter, leaving the elitist disconnect of modernity behind. But if artists are back in society, what happens next? Then what? I keep asking: is it about a redistribution of wealth, based on our American notion of abundance that was and remains globally unsustainable, then and now, always at the expense of others? Or is it about a new goal? What is the ultimate goal of social practice in the 21st century? Is it the redistribution of power? Is it the redistribution of powerful American myths? It is my deeply held belief that the ultimate goal of relocating artists within society is the individual and collective achievement of consciousness; of the fact that we are interconnected and interdependent, of the message that we are one. We have been each other and we will be each other. This is neither religious thought nor spiritual, pious talk. This is a scientific fact. We are recycled; everything has been and will be recycled. Even if we found a way not to kill each other and become better stewards of the Earth, our sun would burn out at some point and we would end, even if we all became saints in organic farms. We are but one more life form cycle. It is humbling. It is powerful. This long-term, prophetic, humbling and empowering message is the power of the conscious cultural producer in society. I know of no other. But yes, African-American young men must be defended against a bigoted police force. Black lives matter; women’s lives matter; queer lives matter—all lives matter. Refugees living in camps, escaping ethnic cleansing, religious persecution, poverty and civil war, daring dangerous migrations, must all be helped by all means possible, including cultural means. They must be empowered. But their ultimate empowerment is not about eventually accessing credit and entitlement to material resources, the traditional American way. Their relocation must not lead to that bankrupt myth. Our true empowerment is the knowledge of our humble and powerful place in the universe. I do not need to be powerful if my message is powerful. Therefore, I am vulnerably engaged in the birthing of a healed culture of consciousness as a lifelong practice. I have often said publicly that this is an embarrassing practice and message. Radical humility remains an embarrassing social stance and text delivery because in America, still caught in the mythology of “global power,” it can come across as the foolish message of a loser for the weak. In an empire of spectacles, it is not playful; it is not entertaining. In a dictatorship of pleasantries, it is not nice. Yet, it is the ultimate message I believe that we should practice because, within its countercultural personal embodiment and public enactment, lies our best hope for a truly grounded form of good power. Because speaking the truth, even if with a bloody mouth, is intrinsically powerful. Ernesto Pujol is a site-specific performance artist and public choreographer with a socially-engaged art practice. Pujol creates silent, durational, walking performances as collective portraits within mythical landscapes and historic architecture, aiming to reveal their psychic underlay in the Jungian sense. Pujol is a student of the human condition, inhabiting dreams, secrets and visions as intangible but vital fragments to understanding and healing history. He is interested in contributing to greater collective consciousness through mindful presence, achieved through deep sight, profound inner silence, and considered gestures. His durational performances have often served as ephemeral mausoleums or monuments to forgotten, or remembered but unresolved, social issues that have been mourned or reflected upon during the experiences. Pujol is the author of Sited Body, Public Visions: silence, stillness & walking as Performance Practice; as well being a contributor to publications such as Awake: Buddha Mind in Contemporary Art. René de Guzman defines power as the ability to make desired results happen. The advantage of using the word ability is that while it can refer to a unilaterally bestowed privilege, it also readily connotes a skill that is developed over time. Aikido embodies a paradox that is relevant to social practitioners who are thinking about power: it is a collaborative martial art. The purpose of Aikido training is to transform conflict into cooperation, even love for one’s opponent. This is an easy and elegant thing to say, and a pretty much impossible thing to do. I also argue that it’s a transformative thing to attempt. When you sincerely approach the study of combat in a collaborative way, your skills around both combat and collaboration evolve in ways that can radically affect how you perceive and wield power. These short clips draw out some of the ways my aikido practice informs how I use power. This is a favorite teacher demonstrating how to receive a fundamental aikido exercise, which is one of the first things you learn. You would learn how to do it, and also how to let someone else do it to you. In aikido you always take turns. You never compete, there’s no such thing as a winner. There is only the role of doer and the role of receiver. You will be in each of these roles half the time. This makes doing and receiving equally important. Here, the teacher shows that when you receive, you want to focus on making a strong connection with the palm of your hand, and that you want your whole body to follow your palm so that your whole body stays connected. Maintaining this connection is a technical commitment you make to collaboration. Taking turns, and the idea that you are still doing aikido when you are receiving a technique, are both structural commitments that the art of aikido has to collaboration. You collaborate because the class is taught in a particularly equitable way. Another favorite teacher uses the same exercise to demonstrate that because this is a martial art, you can’t simply accept these structural and technical conventions and collaborate. If you’re engaged in sincere martial training, you should constantly question and compel collaboration, not just expect it. On a technical level, the two men receiving the technique are keeping the connection between their palm and this wrist, and their whole bodies are moving to maintain that connection, just as the first video demonstrated. …this list of practical reasons to compel collaboration is endless. A third favorite teacher explains how hard it is to keep practicing combat skills collaboratively when you perceive yourself as capable of winning. When your partner is collaborating because your technique works, it is easy to misperceive yourself as having won something. This video talks about resisting the urge to win when you’re doing a technique. This urge is universal, and it can frighten or even hurt your partner. The urge to win also impacts your ability to receive the technique. It leads you to resist and advise your partner, rather than collaborate. If you’re really self-aware, in these inevitable moments of “winning,” you will notice that you’ve become just like the jerks who didn’t want to work with you in the example above. This is a demonstration for a public audience, which is an interesting place to end because aikido, like social practice, is more often experienced between participants than seen by an audience. And as with social practice, it is difficult to see the collaborative nature of aikido from this perspective. From this perspective, it looks way more like engaging in combat than collaborating with partners. These lessons are incremental, and they mostly highlight your own flaws. But they are better than just fighting, and better than just collaboration. And they are slowly changing me in exactly the ways I wanted to change. About the contributor: Deborah Fisher is an artist and the founding Executive Director of A Blade of Grass. She also currently serves as a strategic advisor to Shelley and Donald Rubin, and as a board member of the Center for Artistic Activism. Fisher’s art practice is focused on why and how value is created, and uses group action, entrepreneurship, ritual, creative applications of self help and the intuitive arts, and performance. She is currently partnering with Paul Ramirez Jonas on Dayjob Espresso and Culture, a cafe that offers both delicious espresso drinks and daily art assignments geared toward a general public. Fisher is a shodan, or first degree black belt, in aikido, and trains at The New York Aikikai. View from the Oakland Museum of California sculpture garden. 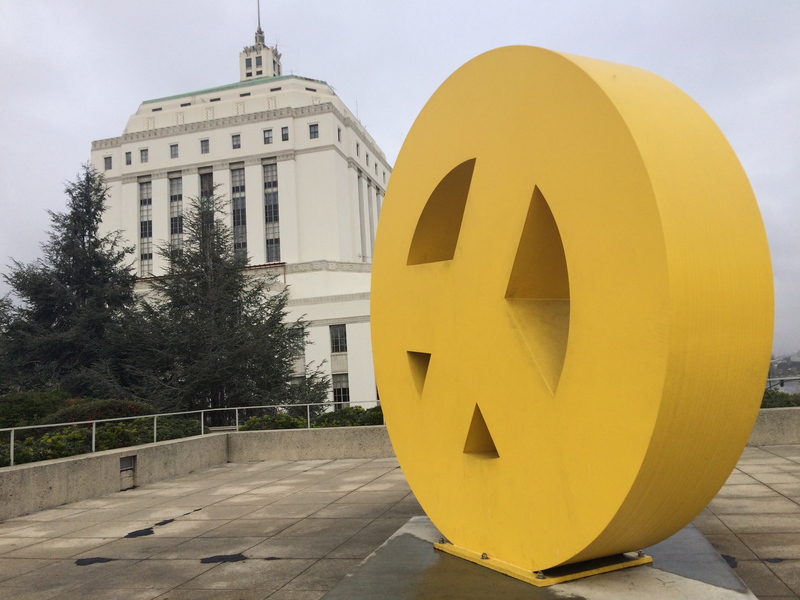 Big Peace by Tony Labat foregrounds the Alameda County Courthouse, a historic Black Panther Party site. Free Huey Rallies were held at the Courthouse in 1968, a year before the Museum opened. Oakland Museum of California (OMCA) hosts Open Engagement (OE) 2016. 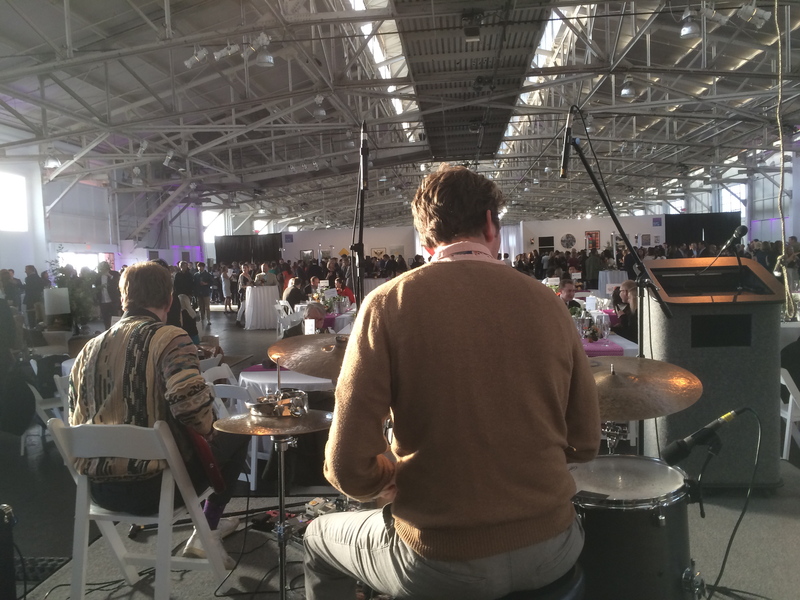 Befitting the Bay Area’s legacy of radical politics, OE 2016 explores the theme of POWER. 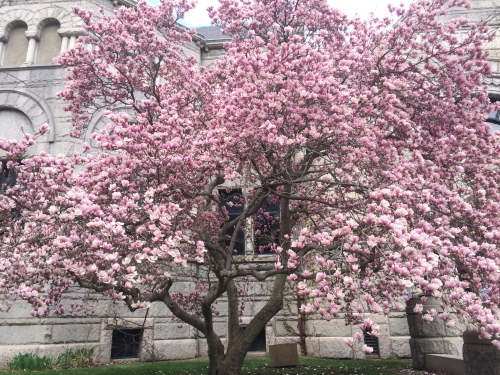 This installment of OE is the first chapter in a trilogy of topics and institutional locales— that consider JUSTICE at the University of Chicago Illinois in 2017, and in 2018, OE returns to the Queens Museum in New York to explore SUSTAINABILITY. Keynote speeches by social practice pioneer Suzanne Lacy and activist Angela Davis bookend the conference. These influential figures represent how OE has evolved as the pre-eminent space for socially engaged artists and creative social justice workers. 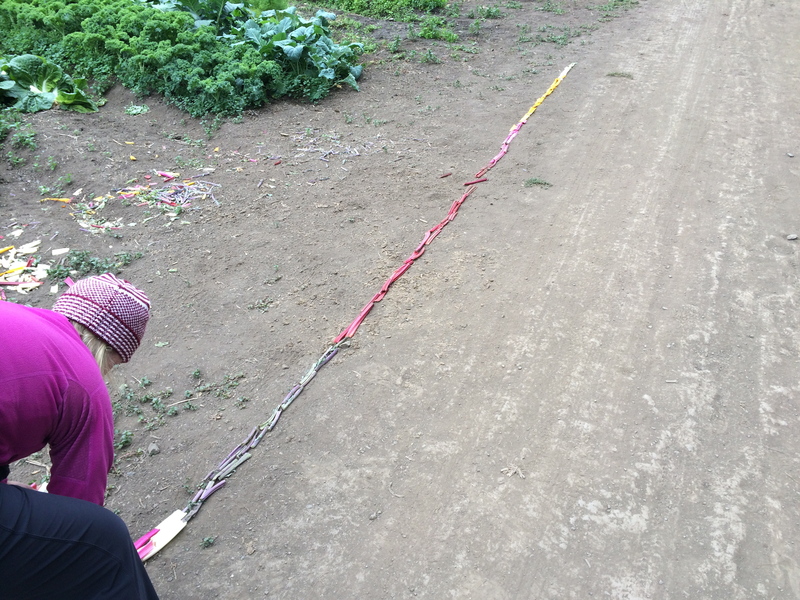 Using cast offs of various kale varieties, Marnie Burke de Guzman makes temporary land art on a winter morning at Green Gulch Farm Zen Center in Marin County’s Golden Gate National Recreation Area. Founded in 1972 as residential monastary and biodynamic farm, Green Gulch signifies Soto Zen’s founding in the west and a beginning of the organic farming movement. Power is the ability to make desired things happen. It can be wrestled from those who have it or it can spring from an independent agency using the means at hand. It is a form of magic and social entrepreneurialism that depends less on what others give and more on our imagination and energy. Case in point, I humbly submit my family history, a classic immigrant’s story of people imagining a new future. Photo credit: Roman Paglinawan de Guzman (b: August 9, 1931-d: November 7, 1991) / Pictured (left to right): Franco de Guzman (b: October 4, 1962-d: June 17, 1980), Jess de Guzman (back to camera), Noemi de Guzman, Polly de Guzman, Noel de Guzman (holding mother’s hand), René de Guzman, and Carolina Pestaño de Guzman. My sister Noemi tells me that in Tagalog my father’s middle name “Paglinawan” means “to make light happen.” Additionally, to those who know me well, my expression here as a four-year-old is not unfamiliar. I look at once confused and slightly irritated. 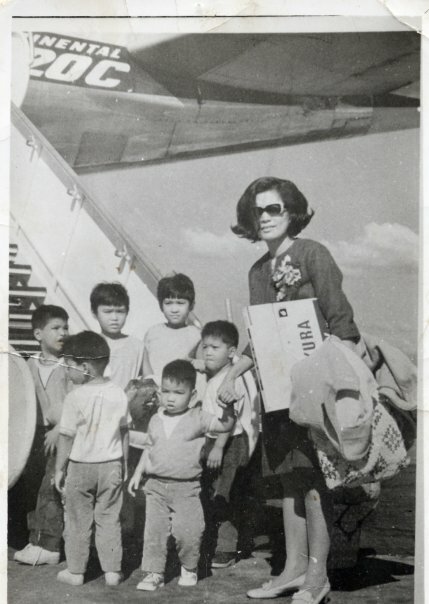 The picture above was taken by my father at the Manila Airport on November 30, 1968 as my family boarded our flight to California. My mom, the fabulous looking woman in the picture, somehow raised six children and managed a successful nursing career. It took amazing energy. 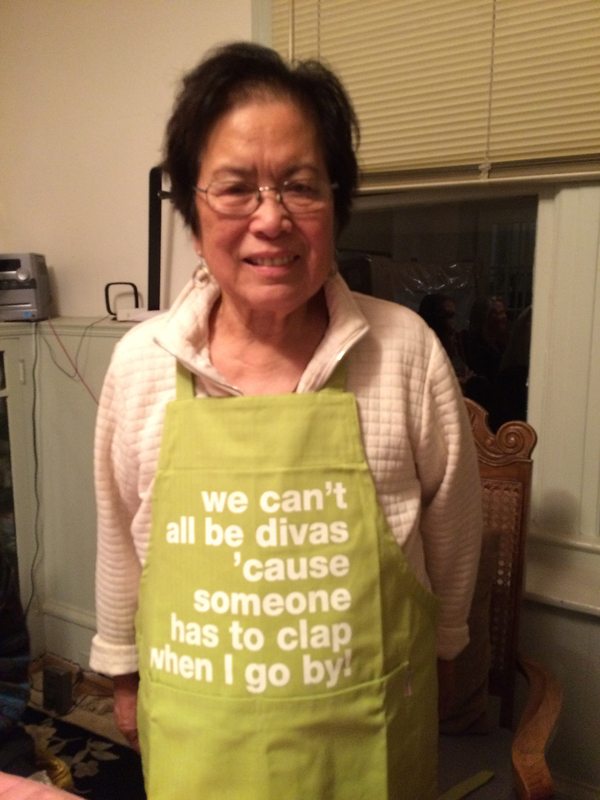 Carolina on her 83rd birthday, October 30, 2015. Amanda Eicher installing Geneology: Adobe Books, a relationship map of San Francisco’s Mission Distict artist community of the 1990s. OE believes in the individual and the genius of the many. Presenters and attendees will no doubt define what power means for themselves as individuals and communities. We will explore how we take personal responsibility to create what we need and examine how we share and support one another. This involves candor to express what we want even if it differs with others. At the same time, we strive to conceive identities that include multiple communities so that we generate power for all. 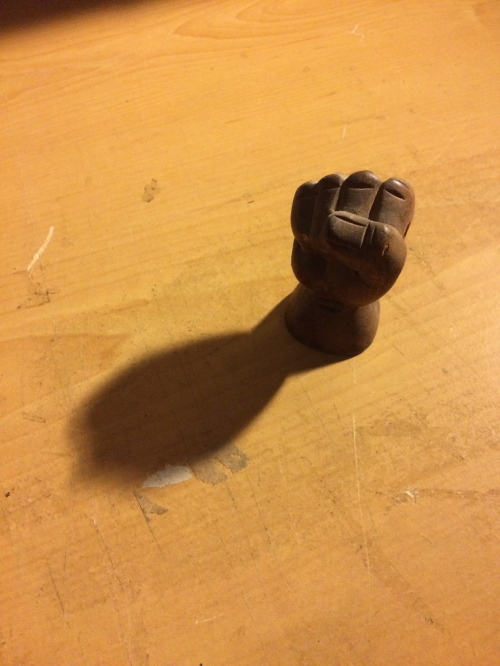 Black power object from the It’s About Time Archive. This archive is a repository of Black Panther Party material in Sacramento, California founded by Billy X Jennings. The digital age has forever transformed the path to power. Arab Spring and #BlackLivesMatter came to be through the use of powerful social networking tools. The creation of movements is less about the individual and control over the material world and more about the crowd and the influence of information. Yet, this new age has resulted in a split between the utopic possibilities of the digital age and the unchanging need to provide for our physical and spiritual wellbeing. 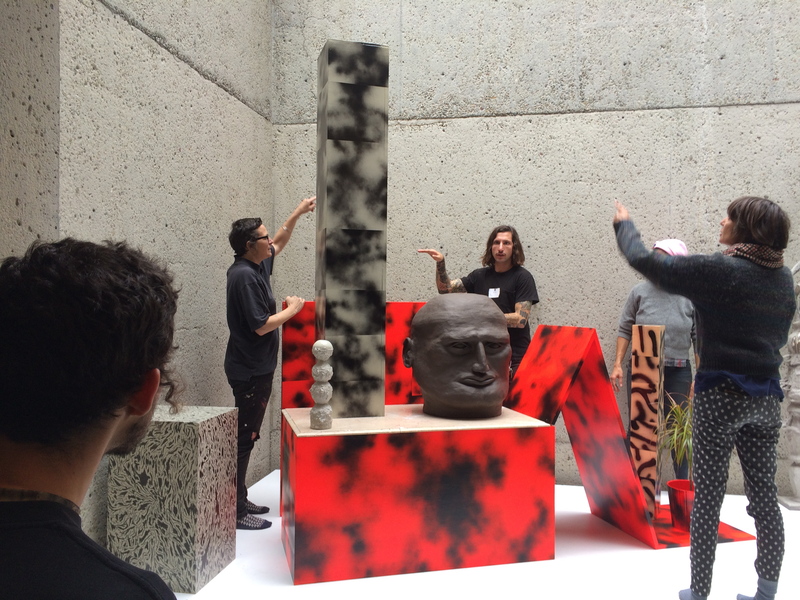 (From left to right) Willy Reed, Alicia McCarthy, Francesco Deiana, Sahar Khoury, and Ruby Neri collaborate on an installation at OMCA. OE sprung from the intuition that there was more at stake than making art to fill the white cube. More important to consider is the potent material of relationships and the desire for relevance beyond the limited confines of the cultural field and market place. At the same time, ongoing innovations were required to address the intractable problems plaguing the world. To weave these parallel threads together takes time and consideration. How can we inhabit this shared space fully? Can we imagine a transcendent power that unites the domains of artist and citizen? What can we learn and give to one another? A view with the band. Headlands Center for the Arts auction at the Fort Mason Center 2015. Let happiness and ecstasy drive our work. Let’s take inspiration from those doing important work that address urgent matters with powerful art. About the contributor: René de Guzman is the Senior Curator of Art at the Oakland Museum of California (OMCA), joining the Museum’s staff in 2007 after serving as Director of Visual Arts at Yerba Buena Center for the Arts. de Guzman had been a sculptor and member of Diwa Arts, a Filipino-American artist collective. Upcoming projects include All Power to the People: Black Panthers at 50, an exhibition that opens at OMCA in October 2016. Each year Open Engagement creates a shared platform and resource for learning through an online blog project. Launched in the lead up to the conference, the blog changes form to address the conference theme, and is used as an opportunity to continue dialogue sparked by the previous year’s programming. Open Engagement 2016 — POWER is guided by the curatorial vision of René de Guzman and will feature keynote speakers Angela Davis and Suzanne Lacy. The conference will take place April 29–May 1, 2016 at the Oakland Museum of California and additional sites throughout the Bay Area. The 2016 blog project is A Reader on POWER. This reader will grow over time, be published incrementally, and will feature didactic responses from a wide range of contributors. These blog posts will provide a designated space to share ideas, provoke questions, and focus our interests leading up to the conference. We have approached activists, writers, thinkers, artists, teachers, arts professionals, community leaders, cultural workers, and more, to provide us with their interpretation and response to the theme of POWER by sharing a resource or media of their choice. This could be a video, an article or excerpt, a song, poster, artwork, or ephemera that is accompanied by a short explanation.